We had some friends over this weekend and they're gluten intolerant, so I wanted to make a yummy dessert that they could eat. 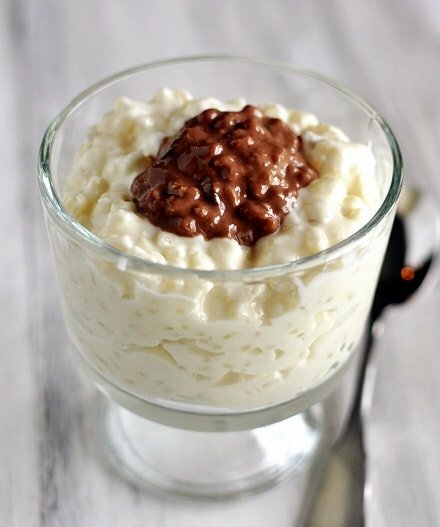 I love rice pudding, so I was excited when I came across it, knowing that it was also gluten free! It was sooooo yummy! Everyone loved it! Stir the softened cubes of cream cheese into the hot pudding. Add the powdered sugar and stir well until the cream cheese is fully melted and incorporated. Transfer the pudding to a large bowl. Press a piece of plastic wrap directly on the surface of the pudding to avoid a skin forming and refrigerate until ready to serve. The pudding can be served warm, room temperature or cold and will keep well covered in the refrigerator for 3-4 days.